At the end of some official business at Treviso, a small Italian city in north-eastern Italy, we were eagerly looking forward to a couple of days in Venice, unquestionably one of the most enchanting cities in the world. From a major maritime power of the Middle Ages to the ‘elegantly decaying’ city of present times, Venice continues to harbour an enduring appeal all its own. After a short drive from Treviso to Mestre at the mouth of the Gulf of Venice, we disembarked from our road bus and boarded a water-bus (vaporetto) No 1 to get to Venice proper, which was a couple of kilometres away. Our conducting officer, a strapping young Lieutenant of the Italian Air Force saw us off, while excusing himself for not being around any longer as he had to be with his widowed mother. We were quite moved by his concern which is a rare thing in the fast-paced life of the Westerners. “Italians are different, still quite traditional,” the Lieutenant assured us. After checking into a small hotel, we did the usual fish-and-chips routine which was a safe fare, as ‘halal’ wasn’t an available option, it seemed. 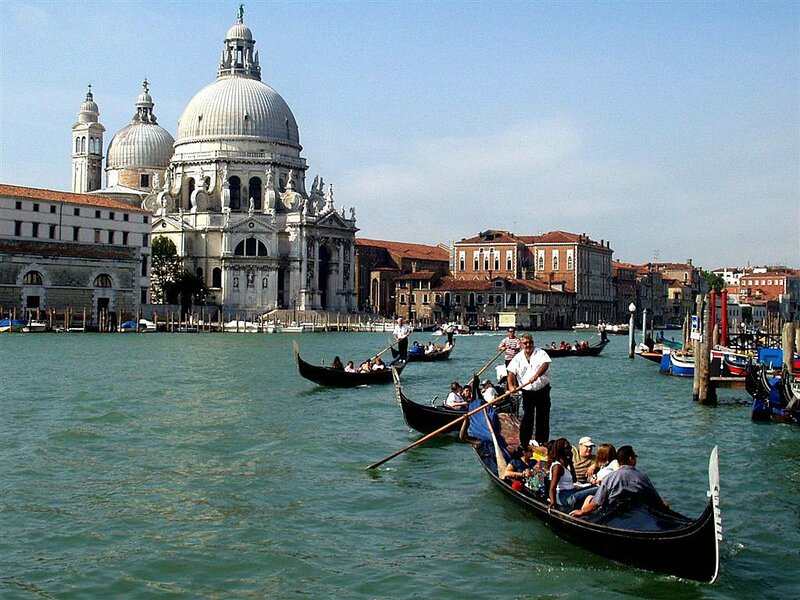 A walk along the Grand Canal that meanders through the heart of Venice, gave us a feel of the enchanting island. The first thing we noted was the complete absence of vehicular traffic, which is turning into more of a nightmare than a useful facility everywhere. Here we were at the late hour, watching the famous gondolas slithering past the waterways, with their gondoliers on the lookout for well-heeled tourists who could cough up the hefty fare. On board one of the gondolas, an accordion player was serenading a rather engrossed couple, whose senses had obviously been overtaken by the sloshing and shimmering waters. Set in the midst of the murky Venetian Lagoon, Venice owes much of its grandeur to the radiant Adriatic Sea sparkling across the narrow strips of land that barricade the lagoon. We wondered what a delightful effect the full moon and the tides would have on one’s senses. Populated by refugees from the mainland escaping successive waves of Teutonic and Hun invasions about one and a half millennia ago, Venice is now subjected to a more welcome invasion by tourists that shows no sign of abatement. The locals are a mere 70,000 in number, mostly an elderly lot, as the younger ones have moved to the mainland due to the very high cost of living, especially accommodation, in Venice. The non-resident work force commutes from the mainland to the island and back daily, and its work revolves largely around catering to tourists who number up to a staggering one million every month. Next morning, we were up rather early and went looking for some coffee and doughnuts for a breakfast. We watched the start of the workaday routine of the island with some amusement as boats brought in fresh fruit and vegetables, school children boarded their school boat-buses and municipality workers got to work collecting garbage in big boat-trucks. The waterways seemed central to every activity. After breakfast, we strolled along the waterfront towards Piazza San Marco, the famous landmark where tourists congregate in hordes. On the way, we saw painters who had displayed their paintings on easels; the scenes captured much of the canals and bridges and the omnipresent gondolas of Venice. I bought a set of two miniatures in water colour and these have graced our home for a long time, ever reminiscent of the splendour of Venice. At the Piazza, we were lucky to manage a sidewalk table for ourselves, as we could sit and watch well past the time it took to dissolve the delicious ice cream in our mouths. 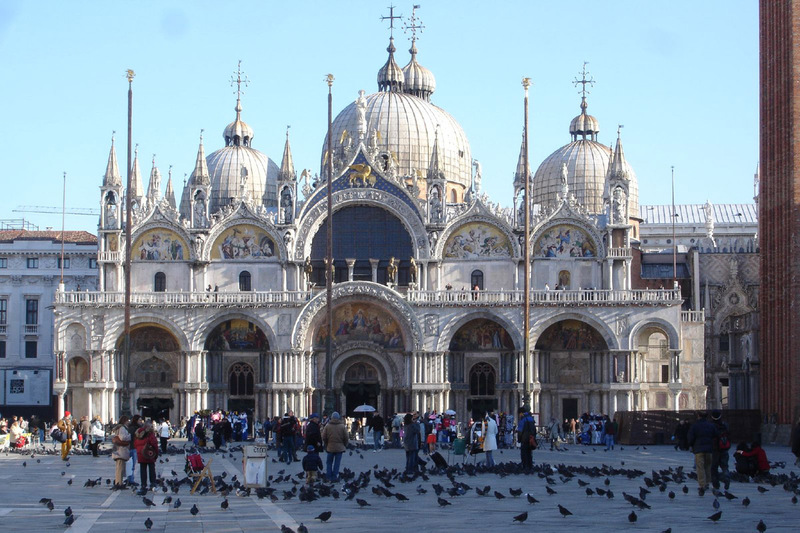 St Mark’s Basilica, the most famous of the city’s churches, lies to one side of the Piazza which takes its name from it. Pigeons, which seem to have an affinity for tourist spots everywhere, fluttered overhead in sudden waves. Some street performers on stilts had a crowd thronged around them, with little children quite awe-struck by the ‘giants’ in their midst. After spending a thoroughly enjoyable two hours at the Piazza, we decided to walk through a narrow backdoor street to the iconic, 16th century arched Rialto Bridge, over the Grand Canal. It was decided that after lunch at Rialto, we would visit the nearby island of Murano, famous the world over for its beautiful blown Murano Glass. We were told to gather at the water-bus stop on Fondamente Nuove, which our tourist maps clearly showed at the northern edge and was not difficult to locate. Boarding the jam-packed vaporetto we set course for Murano, which is just a ten-minute ride. On the way, just off Venice, we passed by San Michele Island, which has served as a cemetery for the Venetians since the beginning of the 19th century. Now packed to capacity, burials are only temporary till arrangements are made on the mainland, in due course. As soon as we got off at Murano, a guide took over and walked us to a nearby glass factory for a demonstration by the master glass blower. Three men were helping the master: one pulled the glass from the furnace and passed it on, the next one worked on forming a rough shape and again passed it on, while the third one did some cutting and finer shaping; finally, the master did the embellishment as the object cooled off into an exquisite flower vase. All this demonstration was for free, but the price was extracted soon after we entered the shop for buying some of the wares. A prominent notice cautioned visitors that any pieces broken by them would be theirs, much like the ones at our crockery shops. Another notice that caught our eye in more than one shop was, that the glass ware was authentic Murano and not Made in China! Bargaining is an accepted form of shopping in Murano and I tried my skills at buying a few pieces of delicate fruit and vegetables made from blown glass. I was made to feel that it was the greatest bargain on the whole island, something which I am reminded of every day, as I look at the pieces in the dining room. 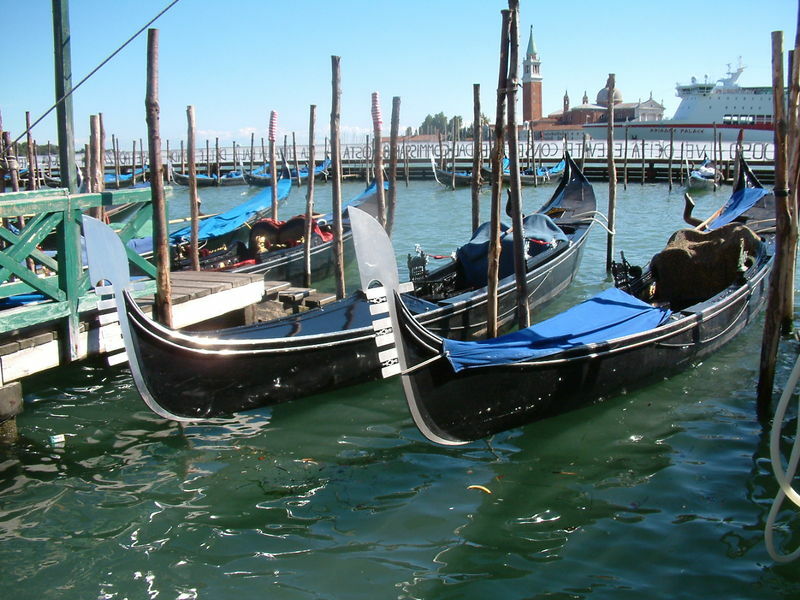 Glass production was moved out of Venice to Murano in the 13th century, as Venetian houses made of wood were considered at great risk of being consumed by glass furnace fires. Today, Murano has come to be synonymous with some of the finest decorative glass ware in the world, and most visitors to Venice make it a point to visit the small island to collect some souvenirs. After a hectic day, we returned to our hotel in the evening. Next day, as we set off for Rome, everyone agreed that it was one of the most exotic holidays that we had undertaken. We had been to a city steeped in centuries of history and culture. It was here in Venice of the 13th century that Marco Polo’s wanderlust took roots and, his travelogues brought knowledge about the exotic Orient to the Europeans. It was here too, that the prolific 18th century writer, adventurer and ladies’ man, Giacomo Casanova, lived a colourful life that is painted in his extraordinary autobiography. History, art, architecture, glassworks, gondolas, shopping and fashions, Venice had everything to offer and we had sampled a bit of all. Most of us mused that even though a honeymoon trip to Venice had been missed out early in our lives, a post-retirement jaunt might be just the right therapy in these hectic times. 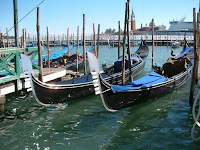 A full moon reflecting in the charming water world of Venice – seen from a gondola – is my idea of a golden jubilee! This article was published in the daily newspaper The News International, on 28 Oct, 2012.